“Savers may well be storing up their savings in a flexible pot during times of economic uncertainty, but this shouldn’t mean leaving the money languishing in a poor-paying account. If savers were to instead move their cash to one of the Best Buys, they could earn 10 times more interest on the top deal versus the lowest on offer from a big high street bank*. “In fact, loyal savers will find that not all brands were generous enough to pass on the 0.25% base rate rise in August 2018. Indeed, a year ago, Barclays Bank paid 0.20% on its Everyday Saver, and it now pays just 0.05% more, at 0.25%. 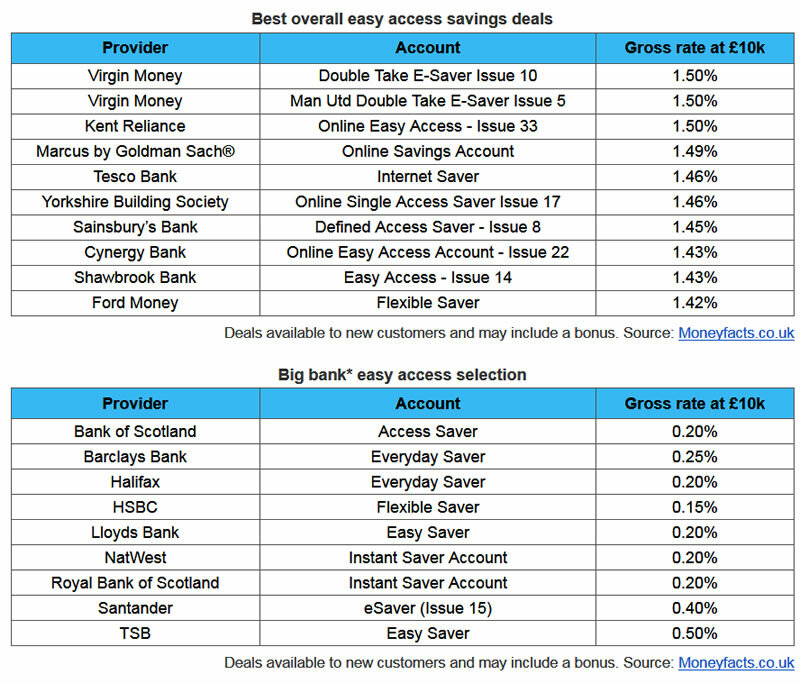 Only Santander increased its eSaver by 0.25% to 0.40%, but even then it doesn’t come close to base rate and will revert to a lower paying account after a year. “Clearly convenience costs so savers will need to rethink where they are storing their hard-earned cash. Some of the best deals on the market come from building societies or the more unfamiliar challenger banks, with the latter taking firm hold of the Best Buy tables, perhaps to remain consistently in the view of savers to draw in deposits for their future lending. “The growing distance between the top rates in the market and those on offer from the biggest banks could grow further still, but right now there is little difference between the market leaders. It’s also worth noting that not every easy access account is as flexible at first glance; Virgin Money for example allows two withdrawals on its 1.50% easy access account, whereas Kent Reliance pays the same rate with unlimited withdrawals. “Mutuals on the other hand are also paying much higher rates than the biggest banks. In fact, savers who have just £100 to invest could get 1.46% from Yorkshire Building Society, which sits firmly in the Best Buys. *Banks selected for comparison are considered the biggest on the high street. This comparison looked at Barclays Bank, Bank of Scotland, HSBC, Halifax, Lloyds Bank, NatWest, Royal Bank of Scotland, Santander and TSB. Deals shown are a selection of the lowest rates. **Rate difference between 1.50% with Virgin Money and 0.15% with HSBC.